Few know the Chancellor of Dundee University in the UK is a Tanzanian. Academic and medic Narendra Babubhai Patel, 78, was born in Lindi in British-ruled Tanganyika Territory. Born to Indian emigrants, industrious Patel had an academic bent of mind which he used it to his advantage at various stages of his life. He pursued medicine at the Queen’s College of the University of St Andrews (renamed Dundee University). He graduated in 1964. Soon he got into Ninewells Hospital in Dundee and worked there for more than 30 years, becoming a Consultant Obstetrician in 1974. Patel’s clinical and academic interests, according to a media report, “included high-risk obstetrics, premature labour, foetal growth retardation, obstetric epidemiology and the quality of the standards of health and clinical provision”. Soon Patel started attaining prominence and “became a Member of the Royal College of Obstetricians and Gynaecologists in 1969 – and its Fellow in 1988. He was elected a Fellow of the Royal Society of Edinburgh in 1999, and served as Chairman of the Academy of Medical Royal Colleges of Scotland 1994- 95. He also became Chairman of the Academy of Medical Royal Colleges of the UK (1996-98) and President of the Royal College of Obstetricians and Gynaecologists from 1995 to 1998, having been its Honorary Secretary from 1987 to 1992, and Vice- President from 1992 to 1995. For this multi-faceted Gujarati, it’s been a meteoric rise. From 2012 to 2014, Lord Patel was the vice- president of the charity organisation ‘Attend’ – and was elected its president in 2014, a position he still holds today. His varied services to the society were recognised by the Royal family and he was knighted by Her Britannic Majesty in June 1997. However, he didn’t remain ‘Sir Patel’ for long. He was made a Life Peer on March 1, 1999 – thereby becoming “Baron Patel of Dunkeld in Perth & Kinross”. 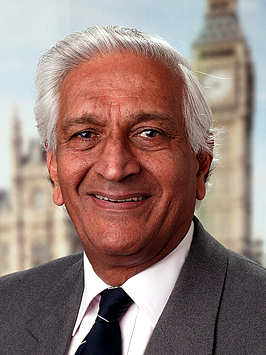 Lord Patel has been Vice-President of the All-Party Parliamentary Group on Maternity Services since 2002 – and of the group on Infertility Services since 2003. As if these onerous positions weren’t enough, Baron Patel has also been chairman of the Stem Cell Steering Committee since 2003 – and a member of the Science & Technology Committee of the House of Lords since then. Lord Patel has been showered with a bazillion honorary and professional doctorates, fellowships and memberships not only in the UK but also in the US, Australasia, Canada, Germany, Finland, Greece, Italy, Argentina, Chile. Baron Patel is married to Dr Helen Dally. They have twin sons and a daughter.